Courtesy photo: Lin-Manuel Miranda’s Tony Award-winning ‘In the Heights’ is playing through Dec. 30 at the Seattle Repertory Theatre at Seattle Center, 155 Mercer St. The Rep production, presented in association with Milwaukee Repertory Theater and Cincinnati Playhouse, runs Tuesdays-Sundays through Dec. 30. Tickets start at $17 at the Seattle Rep box office 206-443-2222 and 877-900-9285, or online at www.seattlerep.org; discounted tickets for groups of 10+ may be purchased by calling 206-443-2224. 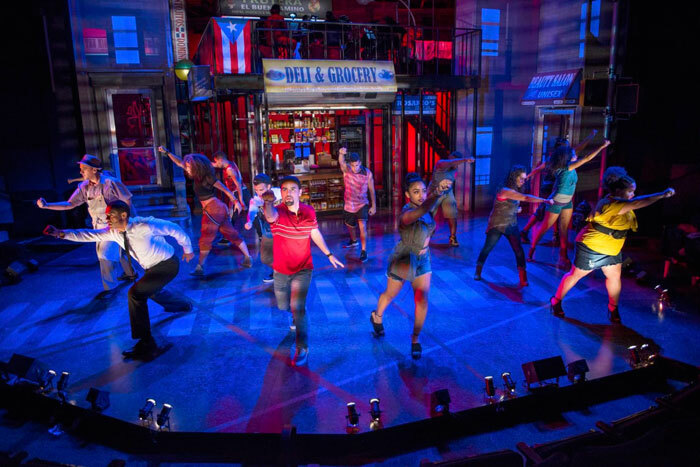 Sassy, sentimental, sizzling and sensational, “In the Heights” lights up the Seattle Repertory Theatre with talent, energy and heart. Before Lin-Manuel Miranda dazzled the universe with “Hamilton,” he snagged a Tony in 2008 for “In the Heights.” He wrote the music and lyrics, while Quiara Alegria Hudes penned the book. The musical won four Tony Awards, including Best Musical, Best Original Score, Best Choreography and Best Orchestrations. Miranda first conceived “In the Heights” when he was a sophomore at Wesleyan University. Over the next few years, he refined it, and in 2008 the musical premiered on Broadway, after a successful Off-Broadway run. Although “In the Heights” may not have achieved the same level of brilliance as “Hamilton,” it breathed new life into musical theater with its hip-hop/salsa/Latino pop-infused score. May Adrales directs the Rep production with vibrancy and verve. The fantastic ensemble cast, with its emotional exuberance, takes you on a Latinx song-and-dance journey, ignited by Miranda’s dynamic music and the high-voltage choreography of William Carlos Angulo. In an era when cybernomics alienates face-to-face connections, this heartwarming musical pays homage to a close-knit community in New York City’s working-class Washington Heights neighborhood. As Latinx immigrants and their families wrangle everyday challenges, they struggle to hold on to their hopes for the future. A first-generation American, Usnavi (Ryan Alvarado) owns the corner bodega and dispenses cheer along with café con leche. After he was orphaned, Usnavi was raised by a kindly neighbor he calls abuela Claudia (a touching portrayal by Yassmin Alers). He dreams of moving to the Dominican Republic; he’s torn between his home and his heritage. Nina (Sophia Macias), a popular neighborhood girl, is revered by her peers for making it out of the hood. She earned a scholarship to Stanford University. Her proud immigrant parents, Kevin (Tony Chiroldes) and Camila (Karmine Alers) own a successful gypsy cab business. They have devoted their lives and finances to ensure their daughter’s success. Now she’s back, after losing her scholarship and dropping out of college. Then there is Benny (David Kaverman), who has a crush on Nina. He works as a driver for her parents. He’s a handsome and earnest young man, but he has a huge problem — he’s not Latino. At the beauty salon next door, feisty Daniela (Lillian Castillo), who overflows with chutzpah and the latest gossip, is being forced to relocate her shop due to increasing rent. Vanessa (Stephanie Gomerez), who works at the salon, dreams of moving to a better apartment, but her credit’s terrible, plus her mother drinks too much. Vanessa harbors a huge crush on Usnavi—he likes her too. Their awkward attempts at a relationship are both endearing and amusing. Carla (Alyssa V. Gomez) also works for Daniela. She’s Vanessa’s BFF, but often clueless about the things going on around her. Usnavi’s lazy but cocky and ambitious young cousin Sonny (Nicolas Garza) jokes around but he also talks of social justice, while his pal Graffiti Pete (UJ Mangune) vandalizes the bodega with his graffiti art. Usnavi calls him a punk. Together these folks make a neighborhood, but all is not well. Rising rents are driving businesses away. A blackout results in damage and destruction, as looters make off with cash and goods. Love goes awry. Little do these inhabitants know that someone in the neighborhood has a winning Lotto ticket worth $96,000. Miranda’s music and lyrics are story-driven, his score alternating between pizzazz and poignancy. The songs may not be Billboard blockbusters, but some are heartfelt. Like the ballad “Breathe,” flawlessly performed by Macias. Her powerful voice soars through the theater as she sings of Nina’s vulnerability and fear of disappointing her parents. In contracts, the show’s title song features the outstanding Alvarado, delivering a rhythmic rap of the woes and joys of his neighbors. The song-and-dance production numbers are glorious, overflowing with energy and passion. During “Carnival Del Barrio,” this critic wanted to dance in the aisles. “96,000” and “Albanza” start gently but roar into anthems. Another favorite, “Blackout,” closes Act One with a whirling-and-leaping nightclub spectacle. The performers are so energetic, you wonder if backstage they are guzzling Monster energy drinks. Add to that an abundance of humor. Paging Daniela — the sassy, bold, and hilarious Castillo brings down the house whenever she sings. Other moments include the story of how Usnavi got his name (our lips are sealed), phrases like “the watermelon of my heart,” and the cheeky references to pop culture icons. Tim Mackabee’s set design creates the ‘hood ambience, as does David Israel Reynoso’s delightfully authentic costumes, while Robert J. Aguilar’s lighting beautifully frames the action. On opening night, there were minor sound issues during Act One, and it was sometimes difficult to understand what the actors were singing. But you could still follow the story. Yes, the book’s a bit schmaltzy. Who cares? We’re basking in music of Latinx joy; never more so than during “The Finale,” when eager actors rush onstage waving flags from the Latin American countries they hail from. All the while singing and dancing to the beat of heart, heritage, home and hope.